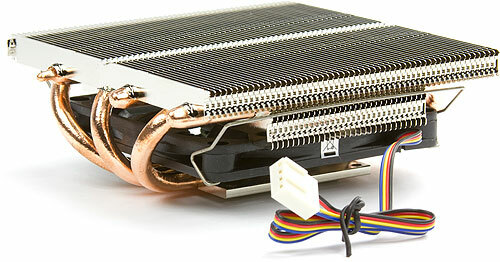 If space is limited and you need a quiet, low profile CPU cooler then the Kozuti could be it! The Kozuti stands just 40mm tall which makes it an ideal CPU cooler where space is limited. 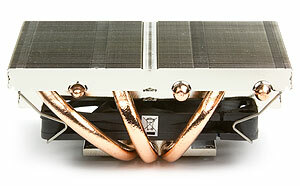 Scythe have achieved this low height by placing the fan underneath the heatsink fins instead of on the top. This obviously reduces the height of the cooler but does not affect its performance. 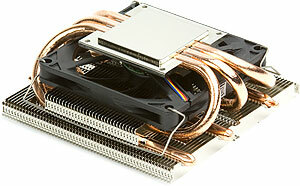 Low profile cooler, only 40mm tall! To generate airflow, Scythe have opted for a PWM 80 x 80 x 10mm fan, which also contributes to keeping down the height of the cooler. The fan produces enough airflow for it to be able to cool CPUs that have a Thermal Design Power (TDP) of 95W, but if you want to keep things as quiet as possible, Scythe recommends the Kozuti for CPUs that generate a maximum of 65W. This fan is very quiet and cools well within the context that I use it for (i3 7100T: max 35W TDP). Easily mounted onto main board. On my Asus B250M-A, the nearest RAM socket looks to foul the heat pipe ends when using Kingston HyperX Fury RAM. Turning the cooler through 90 degrees may eliminate the problem but I have not checked and clearance will still be very tight. Not an issue for me with the limited RAM I need for my application. May not be an issue when using plain RAM without the casing - haven't verified this either way. I'd recommend stumping up the extra for the slightly smaller Noctua NH-L9i (which I also use in another machine) in preference to this item provided that it meets your heat dissipation requirements. Far better warranty too.